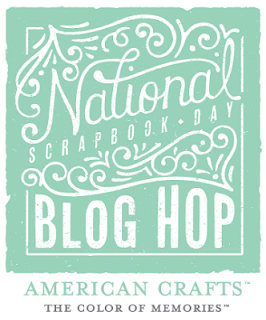 Welcome to the American Crafts National Scrapbook Day Blog Hop! I hope you'll be inspired to whip out your American Craft supplies and start creating after you make your way through the 20 design team members' blogs. There are a lot of fun challenges in this hop so there's no excuses not to play along! MY CHALLENGE: Create an embellished, multi-dimension layout using a grid! To create this layout, I cropped my photos to approximately 2x3 so that they would fit inside the frames. Prior to adhering them, I layered different types of pattern papers (from my 6x6 paper pad). I distressed some and left others with the cut edge. The Love You Always chipboard fit great inside the frames. I chose to add the yellow striped chipboard over the yellow striped frame but I embellished it by punching the red gingham and adhering it to the LOVE chipboard piece and popping it up over the sentiment. This was perfect for my title! I added more clear cut shapes, rosettes, stickers and more to the layout to tie it all together. I added my journaling, the cutest picket fence chipboard and the date using a date roller stamp. Here is the full hop list in case you get a little lost along the way, or maybe you just ran across the hop from right here on my blog and you're just dying in anticipation to see them all right now. Either way, make sure you go through the entire hop, leave a comment on each blog, then visit the American Crafts blog to win a "super ginormous prize"! Next on the hop is Andrea Budjack! Love grid layouts. I like your use of dimension elements too! So gorgeous!! I loveeeeee the colors and the grid design!! Happy NSD! The grid is FABULOUS! Beautiful page. Cool grid! Love all the colors! wow, your grid is so effective, love it! Love how this came out, ADORABLE! This is awesome! Love all of the dimension! Oh wow! I've never seen a layout like this but, what a terrific idea!! Lots of good inspiration here! Thank you!! Happy Scrapbooking Day!! I love the look of a nice clean grid and you did a beautiful page! I really love the pops of red through out it and how you overlapped the embellishments! So pretty! What a cute page! Happy NSD! Adorable photos, adorable page. Love your style a lot! i love grids on layout from time to time! I love this LO!!!! What a great idea! This is amazing! Each little grid section is like its only little LO! LOVE! Absolutely DARLING layout! LOVE all the layers!!! Fun FUN FUN layout. I love all the sweet elements on it. Happy NSD! Love the grid and all the fun color! sweet. Your layout is so IN FASHION right now! I LOVE it!! Very pretty LO - I love to see many photos. Such a colorful fun layout!! I love grid designs! Love the layout of it with multiple squares and pictures :) So fun! Happy NSD! Love how you scrapped this in a grid. This looks great! 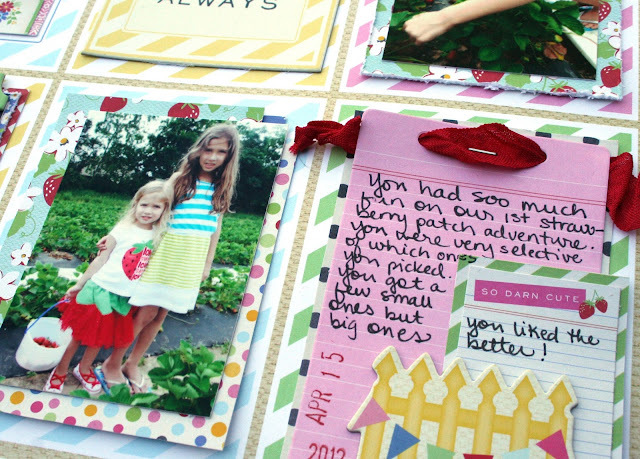 What a creative take on journaling cards. I love it! Happy NSD! 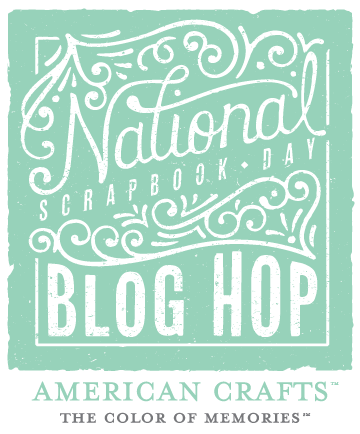 Happy National Scrapbooking Day! Your layout looks awesome, I love the grid! This is stunning! Love the grid and all the little touches here and there. Happy NSD, Heather! Great embellishments and I like the grid. Quite adorable. I love the grid system. 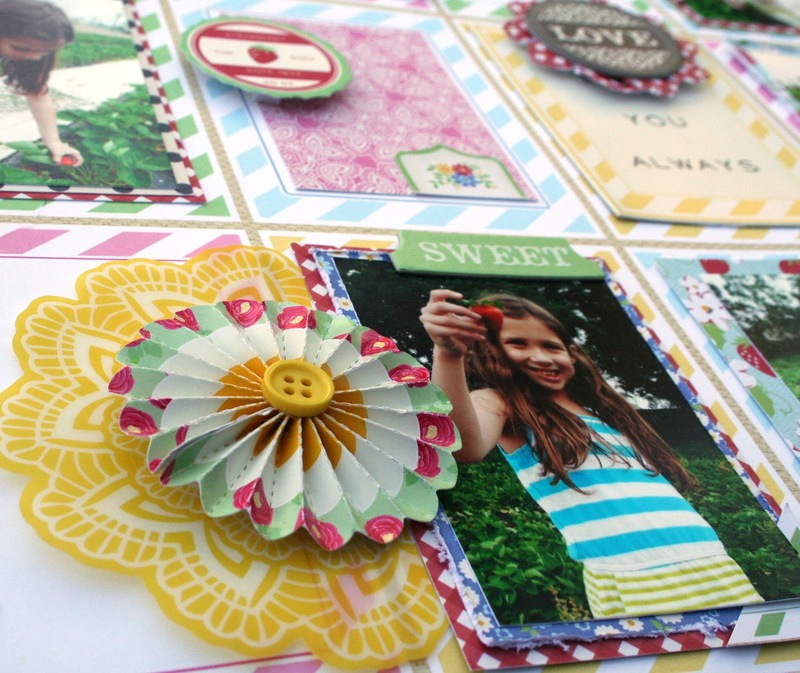 Love the grid, and all the bright colors, this layout just pops! Oh I love the grid, Heather! Just gorgeous! Really awesome page Heather!! Love your grid design! Lovely! Love all the photos, the colors, the design... Truly inspiring :) Love the grid idea as well. You rock! Happy NSD! Happy NSD! This is a layout to treasure! I really like the LO! This is gorgeous Heather! Loving the grid design! Cute layout! Love the blocking you've done! What a great idea! The grid format is very cool. You have decorated each rectangle beautifully! The little girls are so cute. You have really captured the feel of the moment. Great job! Oh my goodness! This is stunning. I love the different colored striped paper and the mix of colors. This is a genius way to use a lot of photos on one page! I love it all! There have been so many beautiful and sensational projects on this blog hop and yours is no exception. Beautiful work, indeed! I just love grids! This is a great page and such an easy way to use a lot of pics! 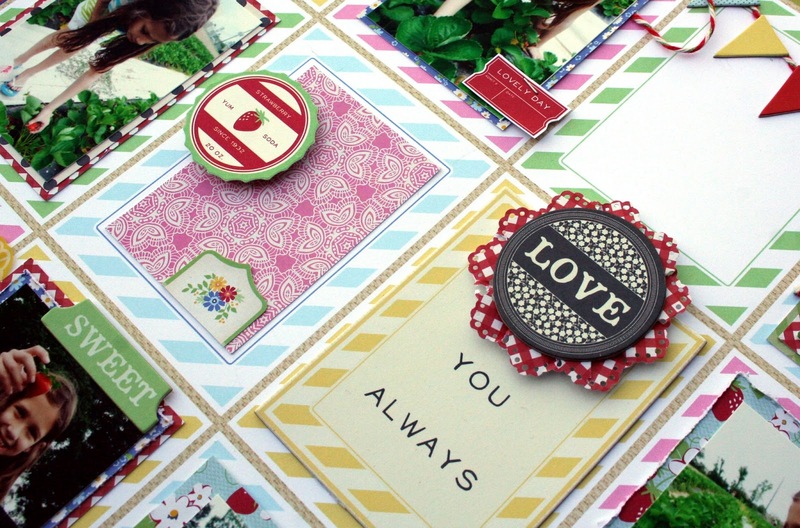 I love you Project Life layout. I'm new to PJ and am always glad to get inspiration from others. Thank you. Beautiful! Love all the special details! what a great challenge! Happy NSD! Love it heather, I need to do rhis! Can't wait to scrap lift this one. Love the grid! This would be perfect for PL too! Pinning again... Your blog is one of my main inspiration sources. Stunning! Love how you used that paper! 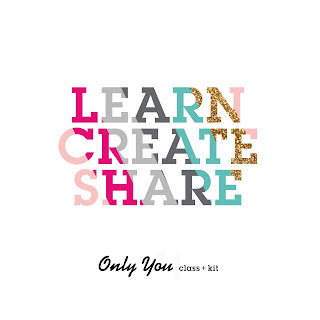 Great idea and fun challenge! I am a big fan of dimension, love the grid design! I love to make pages with multiple pictures, and your layout showcases several pictures without looking cluttered - thanks for the inspiration (and the giveaway)! 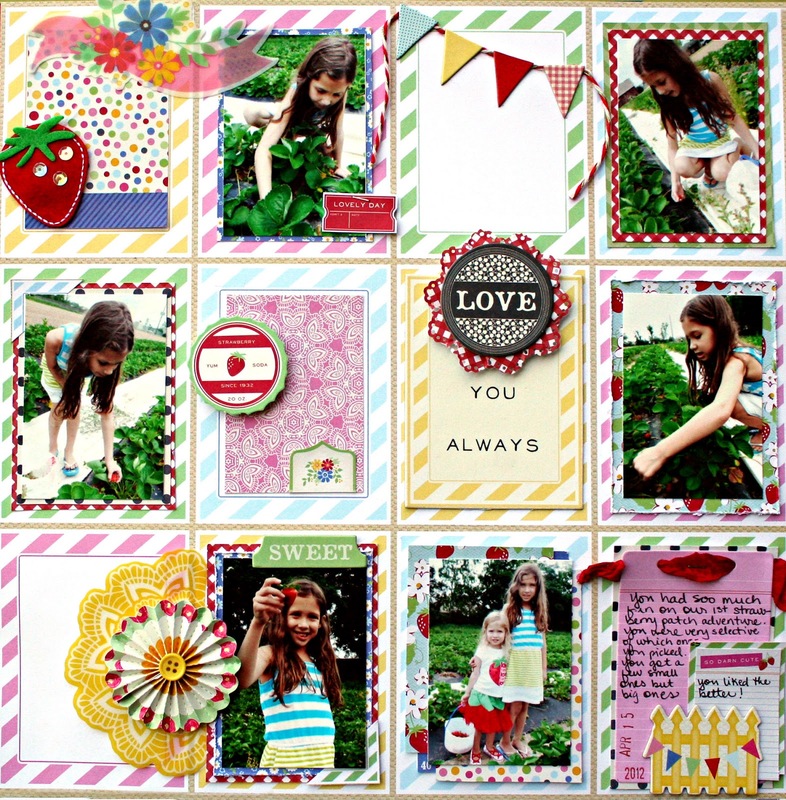 Cute layout, I want to go strawberry picking! I adore grid style pages! The dimension really makes this fun! Awesome job! Great layot!! I like that grid pattern you used for the design! Love your clean style with dimensions added. Thanks for the chance! I have never made a grid layout. Yours looks amazing, thanks for the inspiration! So cool, love your grid design and all the elements you used! love your great use of colors! I like the idea to separate your layout in squares. This is a gorgeous grid layouts!! I love it! love the love sticker and the grid! Love your grid layout. So many awesome embellishments! Gorgeous! GReat job with this grid look! Great job using the grid. Lovely LO ! Wow, that's gorgeous!!! It's like a bunch of beautiful mini pages all wrapped into one. More inspiration - great job on your grid with wonderful details. What an adorable layout. Thanks for the chance to win. Love this technique, the layout is beautiful! Thanks for sharing. Wow...amazing layout. Love all of the little details you added. SO so so so cute! I love the grid design! Such a fun idea. Thanks for the inspiration! oh my! What an awesome grid page and the collection goes great with your photos! Lovely page - the grid design is fantastic! I love a grid style layout. Perfect choice for strawberry pickin photos! Doing a page by grid looks like it is good for embelishing. I love the grid layout! Can't wait to take on this challenge! gorgeous grid with so many amazing details! LOVE it! LOVE how you used the Mayberry paper for a grid layout here! What an eye popping page. I love it an will do a grid page soon! I really like your idea of using a grid for a page layout ... allows you to bring in so many different elements and points of interest. LOVELY page! Love, love what you did here!! Excellent colors, composition and lovely pics!!! WOW this is just so detailed and FANTASTIC!! LOVE it!! fantastic layout and great challenge! Oh I just LOVE the design you created with this page and the tags! GORGEOUS! I love a good grid page, and this one is so fun...so bright and colorful! I especially love all the layering and photo-matting you've done here!